Lentils are celebrated in Italy and in many other cultures for New Year’s, and I Just love to continue the tradition throughout the month of January. 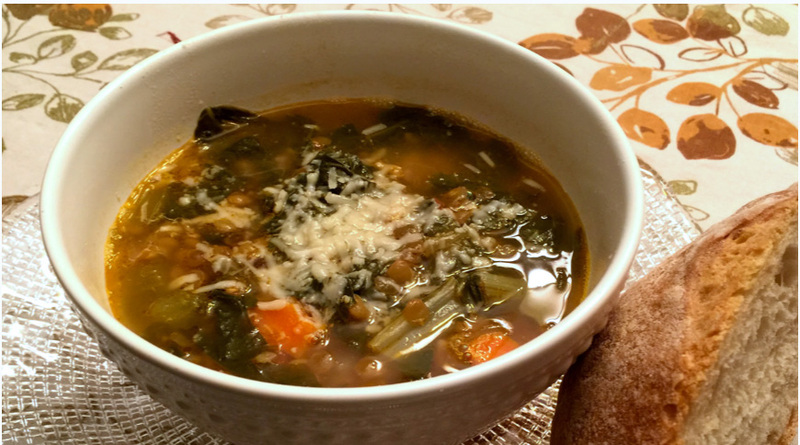 Here is the recipe for one of my favorite lentil dishes, that I’ll be sharing with my family this week, Swiss chard and Lentil Soup. In a mini–food processor, pulse the pancetta and garlic to make a smooth pestata. Add the pestata, and cook until the fat has rendered, about 4 minutes. Add the onion, carrot, and celery, and cook until softened, about 5 minutes. Add the crushed tomatoes, and simmer for 5 minutes to concentrate the flavors. Add 6 quarts of water, the bay leaves, and salt. Simmer to develop the flavors, about 45 minutes. Add the Swiss chard, and cook for 30 minutes. Add the lentils, and continue simmering until they are tender and the soup has thickened and is flavorful, another 40 minutes or so.